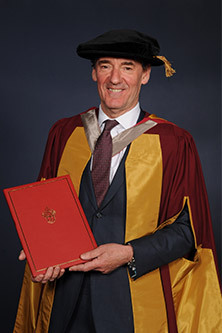 Once described as a "rock star" performer, Jim O'Neill has been one of the world's most influential economists, having spent almost two decades at the top of Wall Street giant Goldman Sachs, where he achieved global renown for his eloquent speeches, his provocative statements and his prescient economic predictions. Before stepping down in April last year, he also managed some 854 billion dollars in funds as Chairman of Goldman's Asset Management division. Although he holds a PhD in economics, he did not cloak his economic writings with complex mathematics or abstruse theorising. Instead he made powerful points simply, by looking at well-known facts and phenomena in new ways. When writing for Goldman Sachs in Global Economics Paper 66 in 2001, Jim created the term BRICs to indicate that a group of countries - Brazil, Russia, India and China - had a nominal GDP that under-estimated their importance by a factor of three, as the nominal GDP measures used current prices rather than purchasing power exchange rates. And his piece noted their astounding growth potential, hinted at important investment opportunities and delineated their emerging status as an issue of importance in global political policy. Elsewhere, he explored issues of global economic trends for the MINTs and N11, using his speeches and writings to change the way people think of the world by making powerful points and using careful analysis. As noted by the Financial Times, "O'Neill has redrawn powerbrokers' cognitive map, helping them to articulate a fundamental shift of influence away from the Western world." Dr O'Neill's early life was relatively modest and he succeeded through using his formidable intelligence and working hard. The son of a postman, he grew up in Manchester, where he studied at the local comprehensive school. From there, he went to the University of Sheffield, where he excelled at economics. A lifelong Manchester United fan, his decision to study at Sheffield was partly taken so he could be closer to the Old Trafford stadium, where he eventually became a non-executive director. 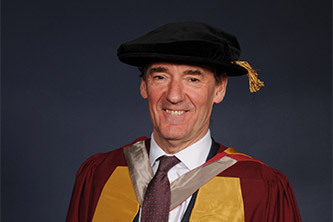 After gaining his doctorate at the University of Surrey in 1982, he worked for more than 10 years in City banks before being appointed as Chief Currency Economist and Co-Head of Economics Research at Goldman Sachs in 1995. He became Chief Economist in 2001 and chairman of Goldman Sachs Asset Management Division in 2010. Jim has not stopped thinking and influencing: he is currently a Visiting Research Fellow at several notable institutes. He is a founding trustee of the UK educational charity Shine and serves on the boards of several other education charities. Dr O'Neill is well-known and well-appreciated at City and has been a loyal supporter of Cass Business School. Despite his demanding schedule, he has regularly made himself available as a guest speaker at seminars and conferences, winning over audiences with his affable disposition and the strength of his arguments.